Not even one of NYC's top wine directors is immune to coffee and breakfast sandwiches. In our series, Liquid Diet, a professional drinker journals every sip of one beverage-packed week. 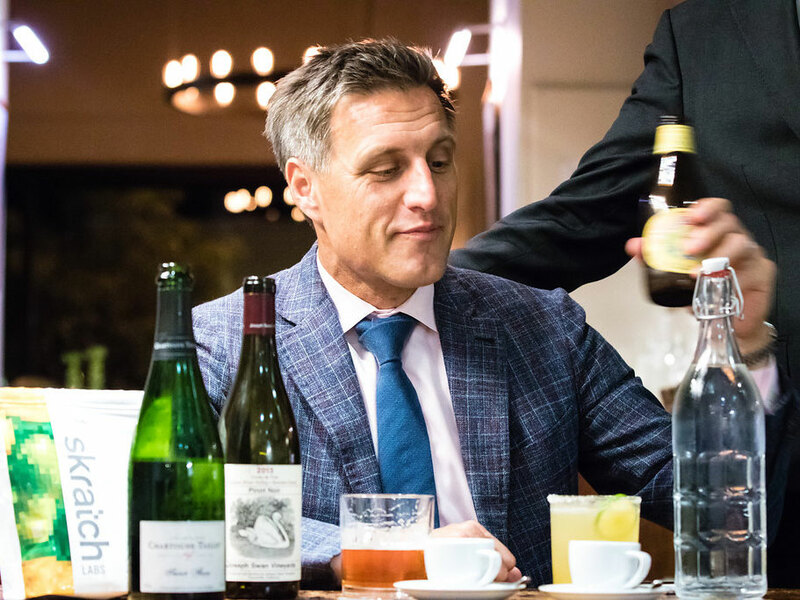 Here, sommelier Thomas Pastuszak, wine director at The NoMad in NYC, documents a week of making his own wine in the Finger Lakes, including a new canned sparkler called “Vinny;” sipping nitro cold brew from Think Coffee while planning for the No Kid Hungry charity event; an epic tasting with Château Mouton-Rothschild at NoMad; savoring a 1982 Produttori del Barbaresco at Lucali in Brooklyn; and a well-earned mezcal at Waydown at the Ace Hotel in Chicago. 6:35 a.m. Up and at ‘em! I’m already a pretty early-riser, but my two-year-old son, Walter, is calling for me and his mom (my wife, Jessica), so we get him out of his crib, read a few of his favorite books, and start our morning ritual: I toast some bread and spread a nice thick layer of butter on for Walter. For Jess and me, I pull out a bag of Oslo coffee (roasted in Brooklyn) from the freezer, and make pour-over — I take it black. Usually, I’m more of an espresso guy, but our Rancilio Silvia M home espresso machine has a broken valve, and I just haven’t had a chance to get it fixed. 7:30 a.m. Today, I’m making a quick trip up to the Finger Lakes to work on the wines I make in the area; the drive will be just over four hours to get there, so I need to be well-caffeinated. We live in Brooklyn’s Fort Greene neighborhood, and across the street from our apartment is a small local grocer—The Greene Grape—so I run over there and stock up on some snacks and San Pellegrino water, jump into my car and get outta town. 11:45 a.m. I stop in Ithaca, NY at the southern tip of Cayuga Lake (my home for 10 years while I went to Cornell University, and where I would then run restaurants after deciding not to go to med school). Power lunch is a Chicken-Taco Salad at Viva Taqueria and a bottle of Ithaca Ginger Beer—I crush this quickly, then continue to drive out to the winery. 1:00 p.m. I arrive in Hector, on the east side of Seneca Lake, at Red Newt Cellars—it’s a great winery, and it’s where I share space in the cellar and make “Empire Estate” and “Terrassen,” my two Finger Lakes wine projects. I meet Kelby Russell, the winemaker at Red Newt (and also for my wines), and we get right to work. We taste through some 2017 vintage Terrassen Cabernet Franc and Gamay barrels, and a series of other fermentations just to get our palates primed, before tasting through all the individual single-vineyard fermentations of my Empire Estate dry Riesling. I select and blend the parcels that will be used in our Reserve dry Riesling, as well as blend the entry-level dry Riesling (I’m super excited about the focus of the 2017s!) Finally, I work on what is going to be a really exciting new addition to the collection of wines: “Vinny,” a delicious and super-fun sparkling wine in a can that will be released for the first time this summer! 7:10 p.m. I jump back into my car to start my drive back to New York City and grab a cappuccino at Gimme! Coffee in Ithaca so I can stay sharp on the road. I eat an Italian sub from Wegmans (dinner on the road), wash it down with some sparkling water—all that high-acid Riesling has really worked-up an appetite! 11:28 p.m. Back in Brooklyn, and immediately go fix myself a cocktail (I deserve it after that long drive! )—tonight I’m having a Gibson, both refreshing and nerve-calming, I catch-up on some emails and then hit the sack. 6:45 a.m. I forgo making coffee this morning, and reach for a cold can of La Colombe Triple Draft Latte from my fridge—it hits the spot and I’m ready to get my day going. 10:00 a.m. I get-in to NoMad, check on some of the allocations and wine deliveries that have arrived, and make myself a cappuccino in our barista station, to accompany a bacon-cheddar egg sandwich I pick-up on my way in (pretty much a staple of my diet). 12:50 p.m. I meet my good buddy Dustin Wilson, owner of Verve Wine, just a few blocks away from NoMad at WeWork; we meet with our friends at No Kid Hungry, a charity (part of Share our Strength) with whom I’ve worked for over a decade. Last year, Dustin and I co-created an event called Reboule du Rhône, a celebration of the wines of the Northern Rhône Valley where we fly-over the top producers from the region for a weekend full of wine dinners and events, and gather the top sommeliers and chefs from around the country to give us a hand (and we donate 100 percent of the proceeds to the charity). Though it’s still early in the year, we’re busy planning our 2018 events, so we meet and discuss over some delicious nitro cold brew from Think Coffee. 3:10 p.m. My friend Jimmy Hayes, a super-talented photographer who runs Mayacamas Vineyards in Napa Valley is in town, showing-off some wines from the estate; we taste their 2014 Merlot, 2013 Cabernet Sauvignon and 2015 Chardonnay. These most recent vintages from Mayacamas are particularly delicious. 6:15 p.m. My wife Jess and I pick-up our son Walter from daycare, and join our friend Jeff Bell (of PDT fame), his wife Auriela and daughter Delilah, for a rare parents’ dinner out with the kids. We meet at Lucali in Brooklyn to eat some ridiculously-good pizza and drink some fun wine: a non-vintage Pierre Peters Champagne “Rosé for Albane,” a 2015 Bartolo Mascarello Barbera d’Alba, and a 1982 Produttori del Barbaresco (Jess’ birth-year)—all super-delicious, but the Produttori with a mushroom-pepperoni pie is especially killer. 6:35 a.m. Pour-over coffee to get the day going (while making some toast for Walter, per usual). 11:00 a.m. Ted Lemon from Littorai Wines is in town, and hosts an awesome sommelier seminar on biodynamics; we taste some of his newer-vintage wines, and the 2014 Thieriot Vineyard Pinot Noir from the Sonoma Coast is particularly bright and energetic. 3:00 p.m. I gather my sommelier team at NoMad for an intimate tasting I’ve coordinated with one of the importers of the famous Bordeaux estates, Château Mouton-Rothschild—we taste through a few of the iconic wines crafted by the estate, including a rare 2014 Aile d’Argent from Château Mouton Rothschild (a small-production white Bordeaux from the estate), as well as 2005 Château d’Armailhac, 2004 Château Clerc Milon, and both 2001 and 2005 vintages from Château Mouton-Rothschild. Not a bad way to get ready for dinner service, and get our energy up! 9:30 p.m. Dinner service at NoMad is in full-swing, and we are slinging some great bottles from the cellar tonight: some highlights of the night include a 2015 Domaine des Comtes Lafon Meursault "Clos de la Barre,” a 1996 Domaine Jean-Louis Chave Hermitage Blanc, a 1983 Château Leoville Las Cases, 2005 Domaine Jacques-Frédéric Mugnier Chambolle-Musigny, and a stunning bottle of a 2006 Soldera Brunello di Montalcino—the last bottle, bought by a great regular of ours, is generously shared with me and the sommelier team. 12:30 a.m. I get home from the restaurant, and after a hot and busy service, I need a cold shower badly; I grab an ice-cold bottle of Pacifico from the fridge, and enjoy my shower beer while rinsing-off. 7:00 a.m. Coffee this morning is a frosty can of Stumptown Nitro Cold Brew from the fridge; strong and textured, I’m fully alert after a can. 11:30 a.m. Following some meetings with the NoMad team, I go next-door to Made Nice for a kale-avocado salad and a super-refreshing green apple and celery house-made soda (my favorite flavor of the lot). 2:45 p.m. Our weekly managers’ meeting at NoMad, and I pour myself a cold brew from our barista station to keep me sharp. 11:15 p.m. Dinner service at the restaurant has been busy and the energy is high. The sommelier team and I taste some great wines that guests have shared with us through the course of the evening: 1996 Champagne Salon, 2005 Domaine Dauvissat Chablis “La Forest,” 1999 Domaine Dujac Vosne Romanée 1er Cru “Les Beaux Monts,” a stunning bottle of 1978 Giacomo Conterno Barolo Monfortino—to name a few. I wrap-up the evening with a glass of 2002 Domaine d'Angerville Clos des Ducs—a really delicious bottle from the NoMad cellar that a wine collector friend saves me a generous pour of (love these kinds of nights at the restaurant)! 7:30 a.m. Jess and I get out of the house with Walter and walk down our block to Hungry Ghost café; we drink a Nitro Cold Brew (on draft), a Kombucha, and snag some freshly-baked croissants. Croissants are one of Walter’s favorite food groups, so he ends-up finishing both his and my croissant (I order myself another one while he’s not looking, though). 11:00 a.m. Today is the annual Wine on Wheels event that my friend Yannick Benjamin hosts in Manhattan, and an army of sommeliers from around NYC come to help pour wine for his charity. While pouring some great wines donated from various importers and distributors, I sip on a crisp can of Modelo Especial. 4:10 p.m. After the event is finished, I walk-over to Charlie Bird with Dustin and our friend Jeff Taylor (actor extraordinaire, and now-GM of Verve Wine). We’re parched after an afternoon of chatting-up enthusiastic wine lovers, so I opt for a margarita with salt, and a refreshing bottle of Reissdorf Kolsch to enjoy with some terrific razor clam crudo. 5:30 p.m. My brother, Alex, is in town from Houston, TX for a quick visit, so I meet him for an aperitif at Compagnie des Vins Surnaturels before we have dinner with our parents (who still live in Queens, where I grew up). It’s a warm early-evening, so we drink some 2013 Királyudvar Furmint Brut and 2015 Weingut Franz Hirtzberger Steinterrassen Riesling Federspiel from Wachau, Austria. 6:30 p.m. Alex and I meet my folks along with Jess and Walter for dinner up the street at Pasquale Jones. Neither my folks or brother have ever been but it’s Jess’ and my favorite restaurant started by our friends Robert Bohr, Ryan Hardy and Grant Reynolds. We drink a bottle of Champagne Savart Expression with salads and clam pizza, then shift into a pair of delicious Italian reds to enjoy with a Margherita and diavola pie (2015 Foradori Teroldego 2015 + 2015 Giacomo Conterno Barbera d’Alba), before getting into a super-savory bottle of 2013 Hirotake Ooka Domaine de la Grande Colline Cornas with roasted dry-aged ribeye and pork shank—everything was pure fire (no pun intended)! 11:30 p.m. Back in Brooklyn, I sip on some Michter’s 10 Year Single Barrel Bourbon, a rare treat from a bottle that my sommeliers gifted me over the holidays—seems fitting on a chilly, rainy spring evening, I don’t pull the cork on it often, but it hits the spot perfectly tonight. 7:15 a.m. Pour-over coffee at the apartment, followed by a nice five-mile run through Prospect Park with my brother—starting to feel alive again after that long day of being out on the town yesterday. 11:45 a.m. After a post-run cold brew, my brother and I join our friend Tommy Wenzlau (of Wenzlau Vineyards in Santa Barbara) at The Modern for lunch. Tommy’s got season tickets to Carnegie Hall, and he’s invited me to join him for an afternoon performance by Maurizio Pollini (a legend in the world of classical music—I grew up playing classical piano, so I’m really looking forward to it). We enjoy a delicious lunch in the Bar Room, and while Tommy and Alex choose not to enjoy any wine, I have a half-bottle of Champagne Laherte Freres Ultra Tradition, which pairs beautifully with the various vegetable and seafood dishes we share. I follow this up with an espresso, and a smoky mezcal-based cocktail from the menu, before walking over to the concert. 6:30 p.m. After the concert, I head home to Brooklyn and take care of some errands, and take it easy as I have an early travel day tomorrow morning. Jess’ sister Katie comes by to hang for a bit, so I open a bottle of 2014 Domaine Roulot Bourgogne Blanc for us all to sip on while we catch-up on our busy weeks. For dinner, we order-in some Thai food from a neighborhood spot we love, drink a bottle of 2015 Domaine de Terrebrune Bandol Rosé—I love to keep-back bottles of this age-worthy rosé. 6:00 a.m. I’m off to Chicago today for work (6:30 a.m. flight, ugh!) for the annual portfolio tasting for Tenzing, my distributor of Empire Estate in Illinois. I fly there for 24 hours to pour my wines and visit some restaurant friends. A very bad, but necessary, black coffee is in order. 9:45 a.m. I make my way to The Ace Chicago, and have a breakfast of bacon and eggs with a banana-blueberry smoothie—laying the foundation for a jam-packed day. 10:15 a.m. Just before getting to the tasting, I enjoy a peaceful moment with a macchiato at Stumptown—caffeine levels properly readjusted. 2:00 p.m. The wine tasting is still cranking and I’m loving the enthusiasm that the Chicago sommeliers I’m meeting are showing about Finger Lakes wines—I take a five-minute break to down a few tacos (Rubi’s has a stand set-up just outside, and are serving al pastor) and an ice-cold Tecate. 4:30 p.m. The tasting is wrapping up and I head to Waydown (the rooftop bar of The Ace) with a few winemaker friends. We enjoy margaritas and sip on some Mezcal Vago to toast a great day. 6:15 p.m. We head down the block to visit the team at Roister for a quick bite—I drink some Valdespino "Deliciosa" Manzanilla en Rama with some buttered pipe pasta and clams (insanely good). 8:30 p.m. A proper burger is in order, so we head to Au Cheval and I inhale a double-cheeseburger with a Rodenbach Grand Cru red ale. 10:15 p.m. A nip of chilled Fernet-Branca at Swift & Sons allows me to wrap-up the night, and I head back to my hotel for the night—an early flight tomorrow morning will put me back in NYC—goodnight Chicago, you’ve been awesome today!